The Three Cs of American Food – What is American Food? Characterized by convenience, access to capital, and a preoccupation with the calorie, American food is significantly shaped by two notions that, at times, can be at odds: trendiness and nutritionism. With these three characteristics, American food culture is often paradoxical in the ways that it idealizes healthiness while also celebrating indulgence, but how this paradox is perceived largely varies across lines of race and class. Racial and economic gaps continue to be incredibly important political issues in the United States, and it is useful to recognize their cultural implications and how these are reflected in the way we look at food. Within American culture, there has been a growing interest in the convenience of reducing food preparation, but for those with lower income, this often comes at the cost of nutrition. The rise of frozen foods and pantry staples, as well as the introduction of the microwave oven, has fundamentally changed how most Americans are cooking at home. Kathleen LeBesco examines this trend in reference to the popularity of Jell-O, stating, “Jell-O fits as a less labor-intensive way for women to “care” for their families, taking the place of time consuming cake, pie, and cookie preparation.”[i] In referring to Alan Warde, she describes how this interest in convenience is associated with the decline of full-time housewives and “an increased load in paid and unpaid labor for women who now juggle responsibility for work outside the home and in the domestic sphere.”[ii] Today, food delivery companies are gaining popularity as a new way to save time, but still meet the comforts of a meal that was actually cooked and not just microwaved. 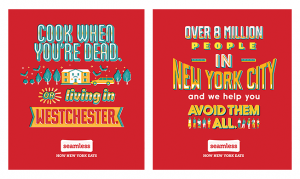 Seamless, a restaurant delivery website, for example, is incredibly trendy in big cities like New York City, San Francisco, and Chicago where there are many individuals working long hours. However, their advertising has received some criticism because of the way they equate cooking with drudgery and ordering through Seamless with eating with ease. These economic and racial barriers attached to convenience help reinforce the moralized social hierarchy that is popularized in nutritionism. While the characteristic of convenience within American food is viewed positively when practiced by the wealthy, it is demonized when practiced by those of lower income. We can see the empirical differences between a Blue Apron meal and a McDonalds hamburger, but ethically these two meals also represent different morals. In Eating Right in America: The Cultural Politics of Food and Health, Charlotte Biltekoff discusses the correlation between obesity and racial and socioeconomic demographics, referencing a study that found that “Negative attitudes towards the obese are highly correlated with negative attitudes towards minorities and the poor, such as the belief that all these groups are lazy and lack self-control and will power.”[viii] Thus, based on the results from this study, it is likely that the public sees a Blue Apron customer as a responsible on-the-go American, whereas the McDonalds consumer is seen as a danger to society’s public health and economic well being. Biltekoff explains this phenomenon by contextualizing the history of nutritionism within the rise of the middle class. Since World War II, the U.S. has had a growing interest in nutritionism, or in knowing the number of calories and vitamins in our food, and in calculating the appropriate serving size. Today, companies like Blue Apron are, essentially, another example of how the middle class uses food to maintain social boundaries. Ultimately, in quantifying food, Americans’ obsession with nutritionism grossly overlooks how food is a product of history. In Sophie Gilbert’s review of Sarah Lohman’s Eight Flavors in The Atlantic, she states, “American cuisine is an ever-evolving thing. It shifts and expands rapidly alongside changing patterns of immigration, culture, and even politics.”[ix] However, just like the cuisines themselves can change, it is important to consider the ideologies attached to food, and the ways in which they can be altered so as not to reinforce social injustices. Ultimately, a key issue for the future of food will be engaging more Americans in discussions on the political, cultural, and economic consequences of our food systems. Image Credit: Louise Ward, “Blue Apron Meal Kit,” https://commons.wikimedia.org/wiki/File:Blue_Apron.jpg. [i] LeBesco, Kathleen. “There’s Always Room for Resistance: Jell-O, Gender, and Social Class,” In Sherrie Inness (ed.) Cooking Lessons: The Politics of Gender and Food. (Lanham: Rowman and Littlefield, 2001), 136. [iii] Slagle, Ali. “Seamless’s Ads Are a Huge Step Backwards for the Food Movement – and Seamless,” Food52 (October 28. 2015). [iv] Cave, James. “Why Food Delivery And People-Hating Go Together Seamlessly,” Huffington Post (September 24, 2015). [v] Severson, Kim. “It’s Diner in a Box. 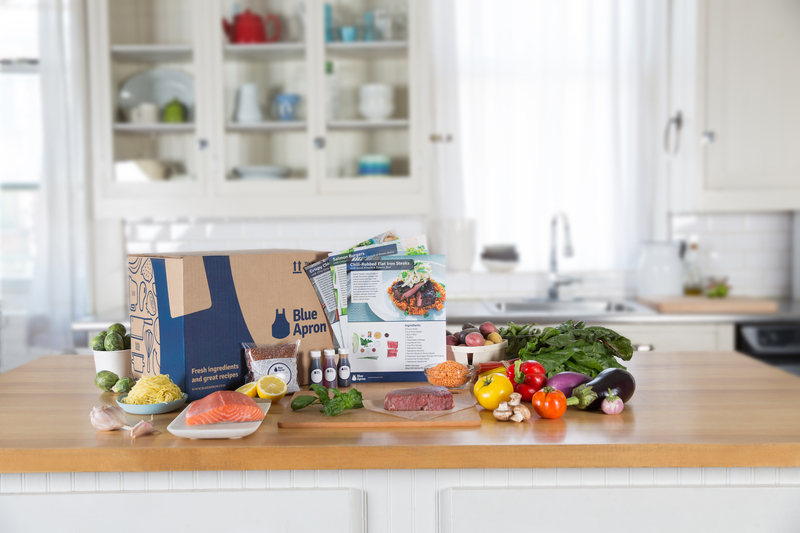 But Are Meal Delivery Kits Cooking?,” The New York Times (April 4, 2016). [vii] McMillan, Tracie. The American Way of Eating: Undercover at Walmart, Applebee’s, Farm Fields, and the Dinner Table. (New York: Scribner, 2012), 5. [viii] Biltekoff, Charlotte. Eating Right in America: The Cultural Politics of Food & Health. (Durham: Duke University press, 2013), 142. [ix] Gilbert, Sophie. “How American Cuisine Became a Melting Pot,” The Atlantic (November 23, 2016).